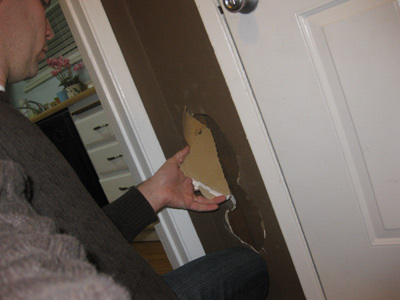 A hole in your wall can seem like a big deal, but they are really easy to fix. You've just got to cut away the broken parts, screw in some support and drop a new piece of drywall into the hole. Color matching the paint used to be trouble, but with today's color-matching paint counters, that is easy too. Your walls are probably made of drywall, which is chalky gypsum board sandwiched between sheets of thick paper. 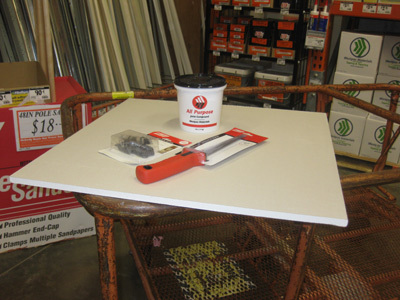 Drywall is pretty easy to work with, and because everyone uses it to build houses, everything about drywall is cheap. Easy, Illustrated instructions on how to fill a nail hole in the wall. If there are loose chunks of wall hanging loose or pushed in, pull them out and throw them away. 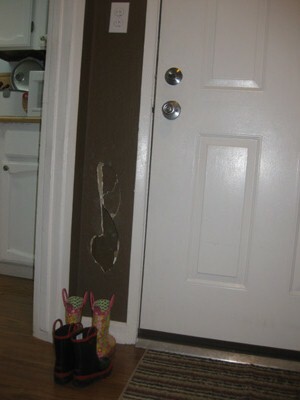 Next, make a trip to the hardware store and buy a square of drywall and a tub of wall paste known as "joint compound". Drywall is sold in big sheets, like 10 feet tall and four feet wide, but most hardware stores have smaller squares you can buy for about $4. I think this one from Home Depot was about 24" x 24". I think the tub of joint compound was $5. 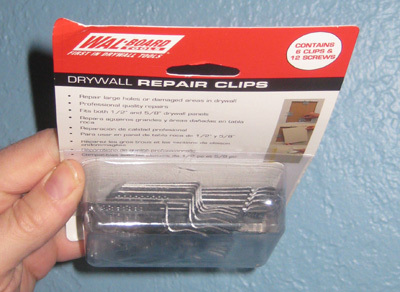 I also bought a drywall saw for $8 and a set of "drywall repair clips" for $4. 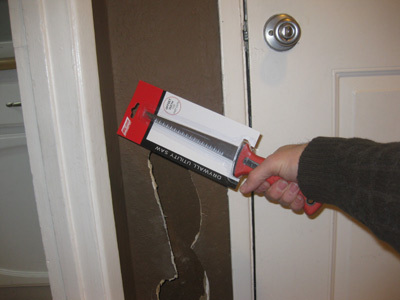 You might also need a few long screws and a spackling knife, and whatever it takes to paint over the repair job. I didn't use the repair clips and I had to go back for a $3 stick of lumber. More on that later. Its a little weird to cut away a bigger hole in a spot you are trying to repair, but that is what you should do. Be careful with the drywall saw, especially a new one. They are super-serrated. Cut the hole into a square or rectangular shape. This will make it easier to cut a patch to fit snugly in this hole. The sides don't have to be perfect. The wall in these photos doesn't have any fiberglass insulation. Your walls might have some fiberglass batting in there. If they do, wear gloves, leave it in there and push it aside as you work. The drywall on your walls is held up by wooden beams known as "studs". 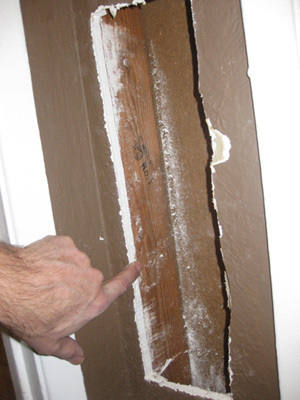 Usually wall damage will be restricted to an area between two studs, but if it does span two gaps, don't chew up or cut into the stud when you pull the broken drywall off. 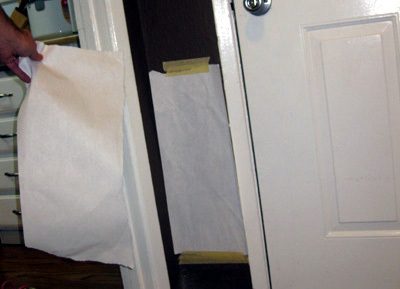 One way to get a patch that will fit into your hole is to tape up a sheet of paper and rub a crayon around the edge of the hole.